This is Petal. 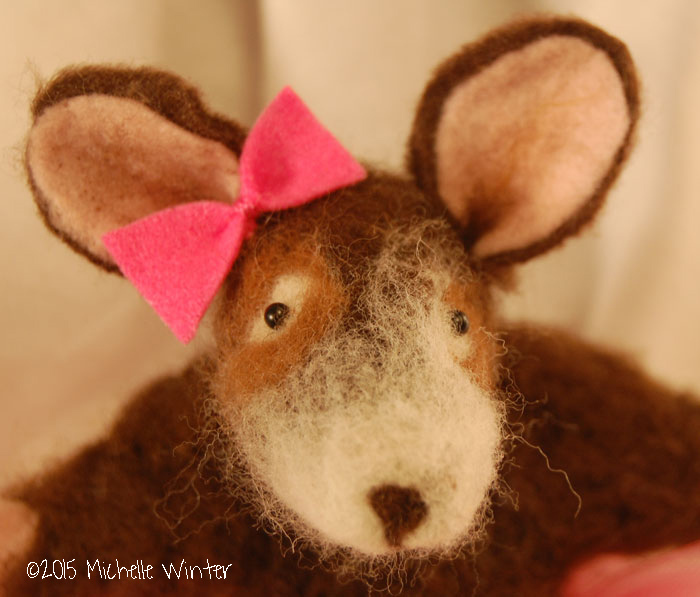 She is needle felted from Shetland and Merino (but we don't talk about it because she is a little bit afraid of sheep). She was super excited to begin the Transform Bible Study because she really does want to grow closer to her Lord . . . until she realized that transformation meant change. She began to shiver and shake. Change is scarey! But then she remembered that God has always been faithful, in her own life and throughout the Bible. She thought, "God's Faithfulness makes me feel brave." and asked me to make her a special item. She wanted to wrap herself in God's Word to remember that He is faithful. We settled on a cape in her favorite color with her favorite chapter from John. She is ready now for this adventure! she knows He will be there too. Let us hold unswervingly to the hope we profess, for he who promised is faithful ~Hebrews 10:23. Just a word or two on process: My sweet daughter loves to make dolls. Olivia really is the doll expert around here, and I think I see the powerful potential for metaphor in them. They sort of stand in for "us." This week I was feeling vulnerable and I wanted someone to stand in for my "shivering and shaking" who could also stand in courage. Olivia kindly walked me through the steps to needle-felting and let me choose wool roving from her stash. She offered lots of encouraging words and was suitably delighted with each success. Everyone should have an Olivia to cheer them on. Hand sewing is comforting to me, and so I wanted very much to sew Petal some nice clothes. Unfortunately, Petal was very opinionated on this topic. She was already wooly and warm. All she wanted were muck boots, a tutu and a cape. So, I had to content myself with just hand sewing the boots. The tutu is knotted tulle over ribbon. For the cape, I afixed a piece of fabric to an ordinary sheet of paper with 505 temporary spray. I taped the leading edge with ordinary Scotch tape and ran it through my printer. I have never had a problem with printing this way on fabric. Olivia and I have long talked about collaborating on a doll project and I would really love to pursue that. I think it could make a fascinating study to read through the verses that describe us through God's eyes and make a doll for each one. And it would be a lovely excuse to spend lots of time with my favorite daughter.